Harmless and painless during the insemination procedure. Suitable for uterine cavities of all sizes. 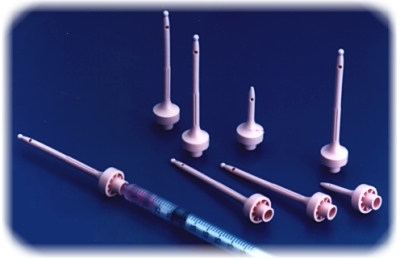 Optimal rigidity enables the Cannula to fit itself to the curvature of the uterus. The shape of the flared base serves to seal the cervix, preventing the back-flow of injected contents. A small volume of washed sperm can be used - an advantage for sperm banks. There are two versions of this Cannula: the long for intrauterine insemination (IUI) and the short for intracervical deposition of sperm. For best results - It is recommended to use this Cannula together with Makler� Insemination Device, which serves as a syringe holder and provides an effective sealing mechanism during the insemination procedure.